During the European Football Championships back in June was it? I saw a couple of Eastern European trucks with these rather natty Country colour coded mirror covers. I’m guessing they came about as a new way to support your home team or may be it was just a coincidence that they appeared during the soccerball. Were they on sale or were they just home made accessories?? I did see another national flag on another different truck but amazingly and shockingly it seems that I didn’t take a photo…..sack me! This little Slovakian Renault Midlum drawbar certainly looks the long distance trucker. 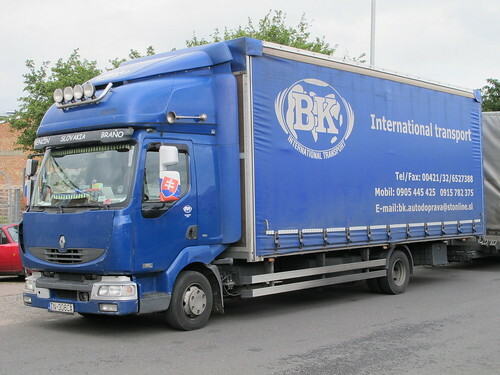 This entry was posted in International Mega Trucking, Photos, Renault by truckbloguk. Bookmark the permalink.